I’m probably spoiling my daughter of late, who am I kidding, always! 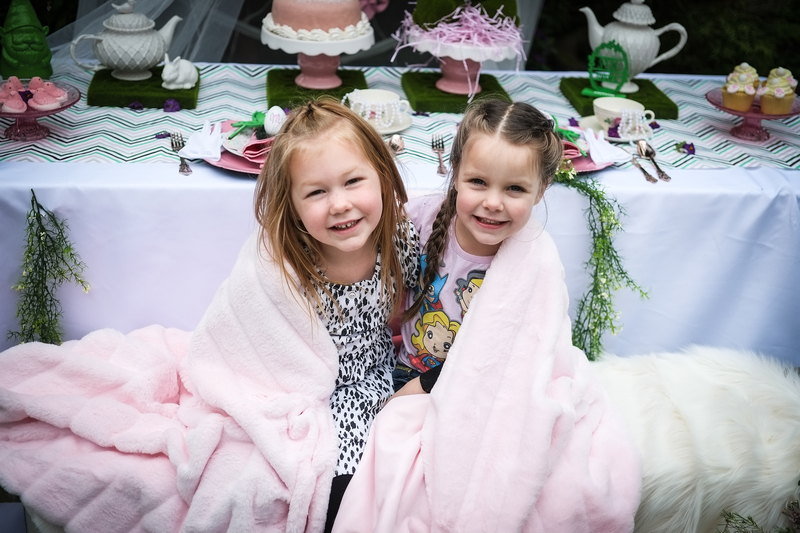 For years I’ve done more boy’s parties at home than girls (I have an older son), so it’s been a treat getting in touch with my girly side again! Not to girly of course, she is a race car fanatic after all…but I do what I can (check out my previous blog on her pink and gold race car birthday party). So when my friend Phuong asked me to borrow my children (!!) 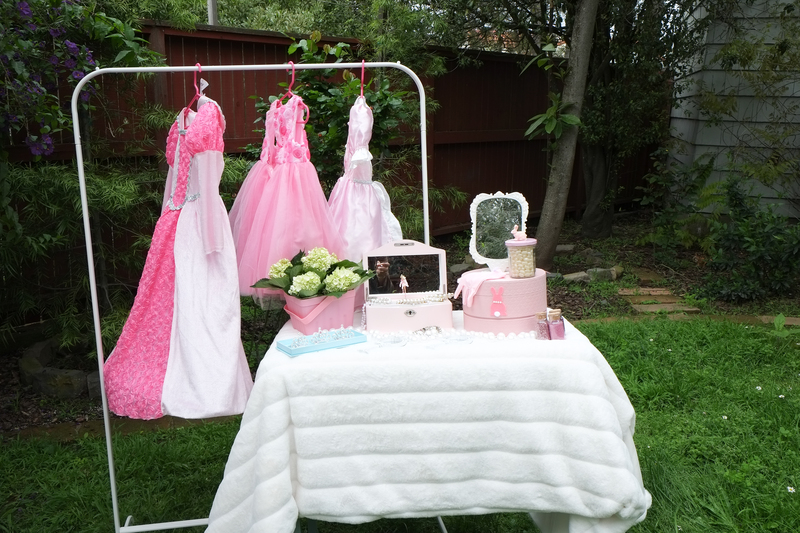 and my backyard for a modelling session, to the launch her new children’s line, Macaroon, I jumped at the chance. Phuong’s son Keith is one of my son’s best friends and her company is “Tourance”, she sells luxuriously soft faux fur and I’ve been a fan ever since she gave Harrison one for his birthday. If you follow me you know I recently took a pilgrimage to Ikea for Easter supplies, my latest and definitely not last trip. While I was there I was totally drawn to a chevron wrapping paper that mixed a Kelly, a light and a dark green with black, soft pale pink and gray. It was so unique and just spoke to me. I knew I had to do something with it and that the coloring would work great with moss, which I’m really into at the moment. 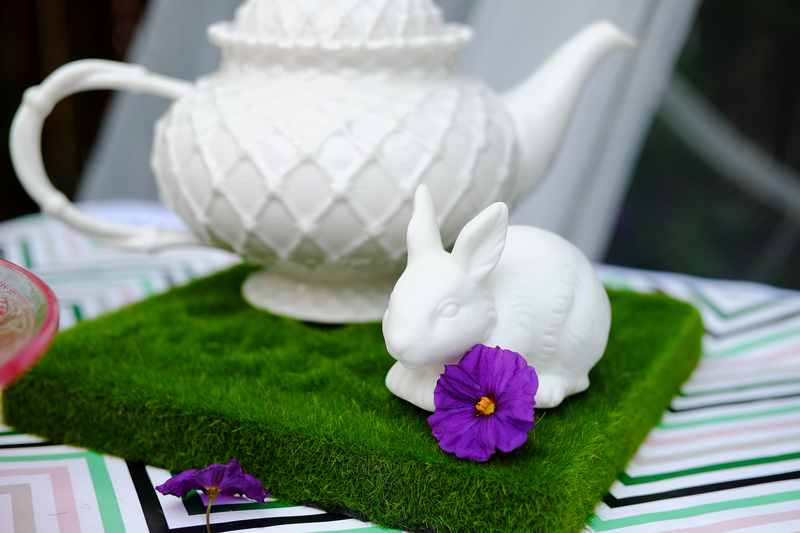 I had found some cute bunnies at target (Spots corner) in moss & trivets at Michaels in the garden section that I knew would work perfectly. See I told my husband they would come in handy! 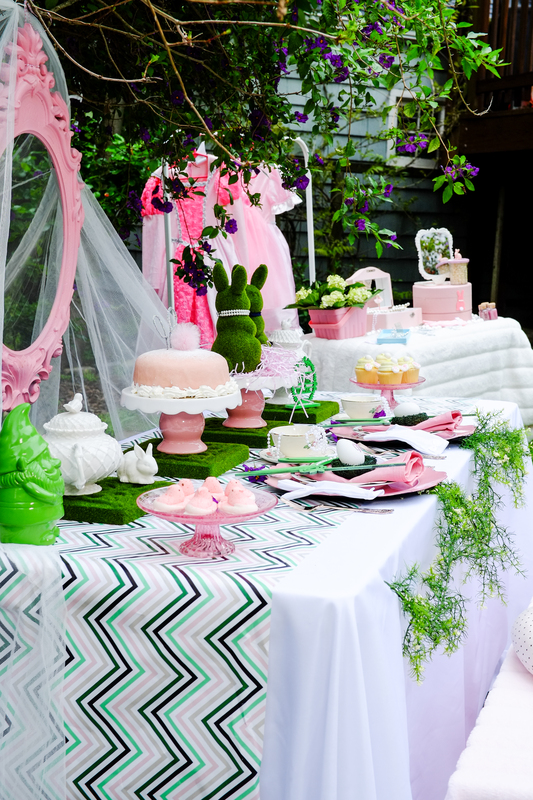 These elements plus Phuong’s request were the inspiration for an outdoor dress up party celebrating fresh green spring. 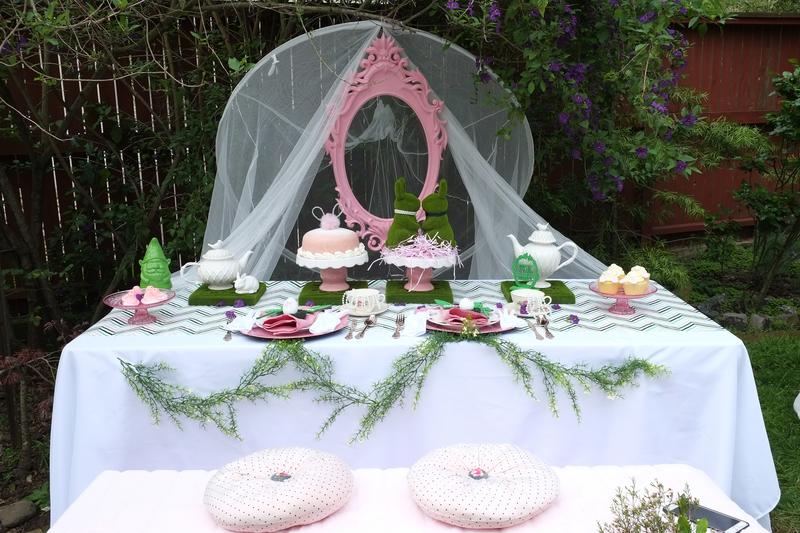 A pink frame over the table, with soft flowing netting over the table! 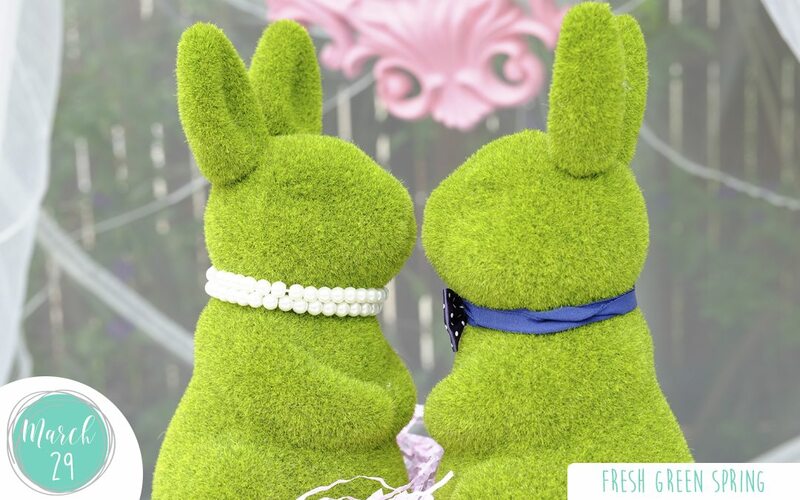 Framing our bunny romance! this netting is over my daughters bed and its so romantic! 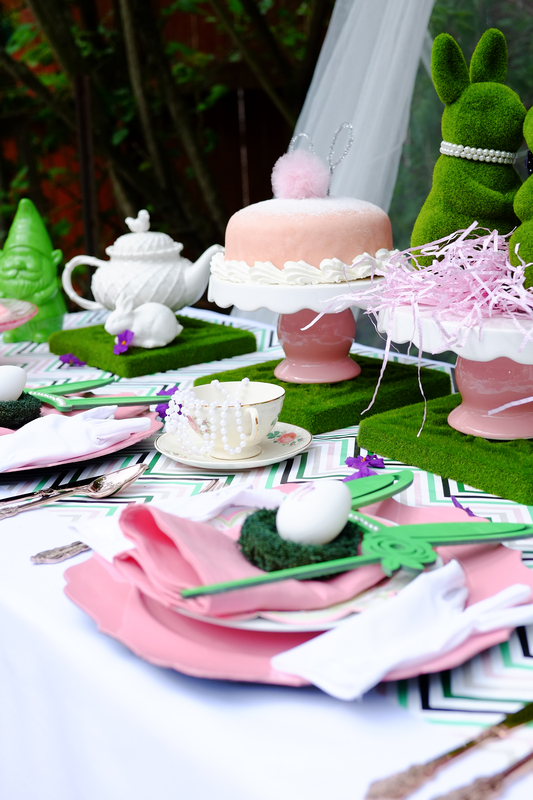 Prior to the party I did a little bit of DIY to keep some of the items I’d found within the green theme. 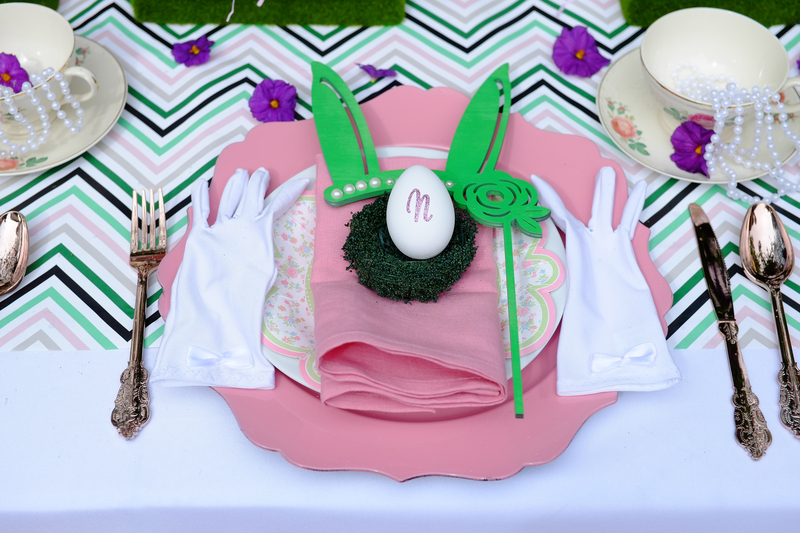 I used spray paint to make the wooden dress up bunny masks and a “Spring Wishes” sign, kelly green and I sprayed the little birds’ nests dark green. 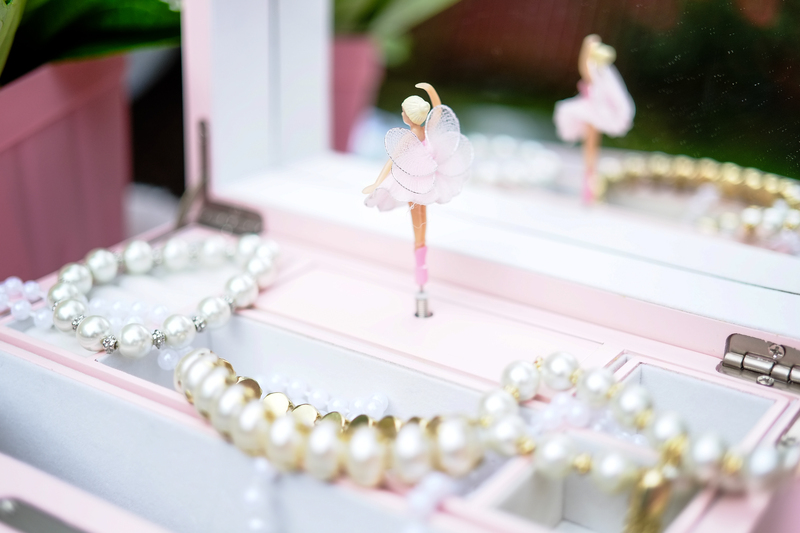 I then “glammed up” these items using stick on pearls. I added them to the masks and to the “spring wishes” sign, for a little bling. 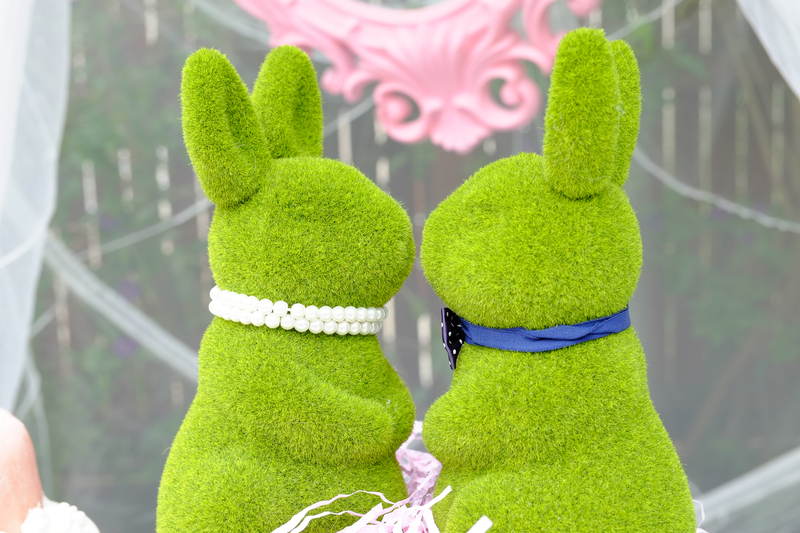 Seeing the girls were getting dressed up I had to dress up Mr. & Mrs. Bunny too. 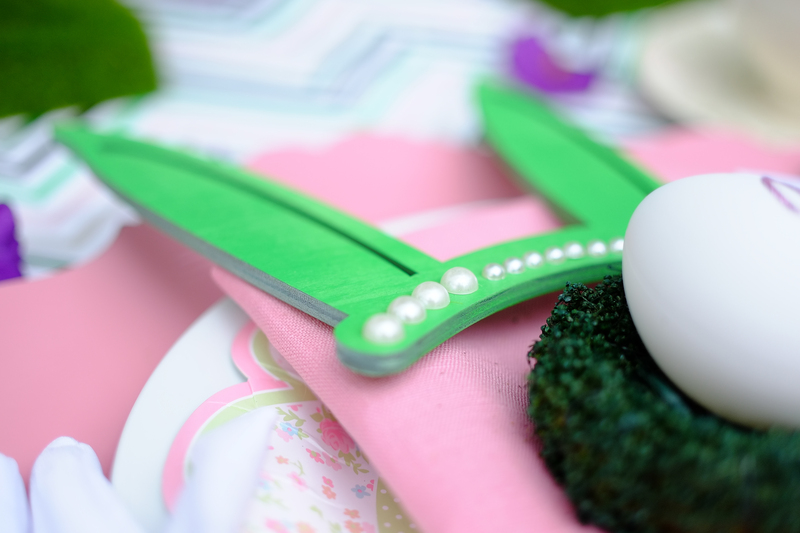 I found a pearl bracelet for Mrs. Bunny’s neck and one of my daughter’s bow tie hair elastics for Mr. Bunny. 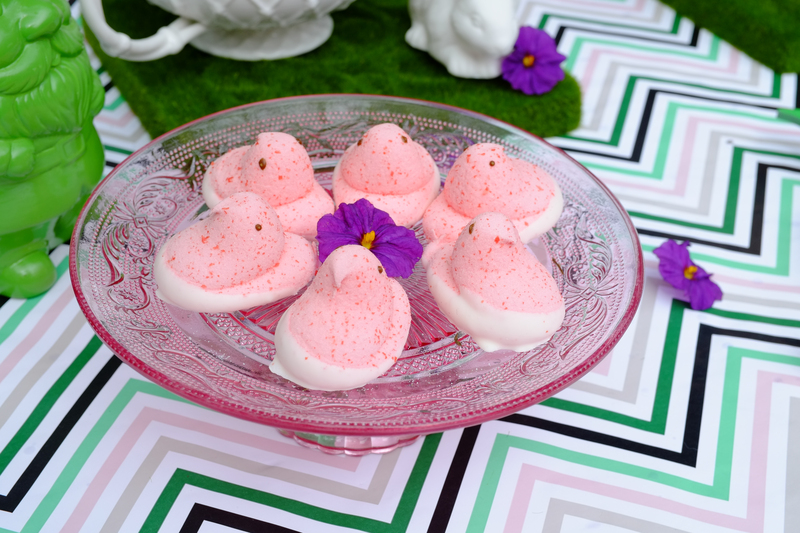 Simple stick on pink glitter letters were put on the plain white eggs (found in the Target dollar aisle for decorating) as a simple monogram place setting for the girls. I popped these into the green birds’ nests. 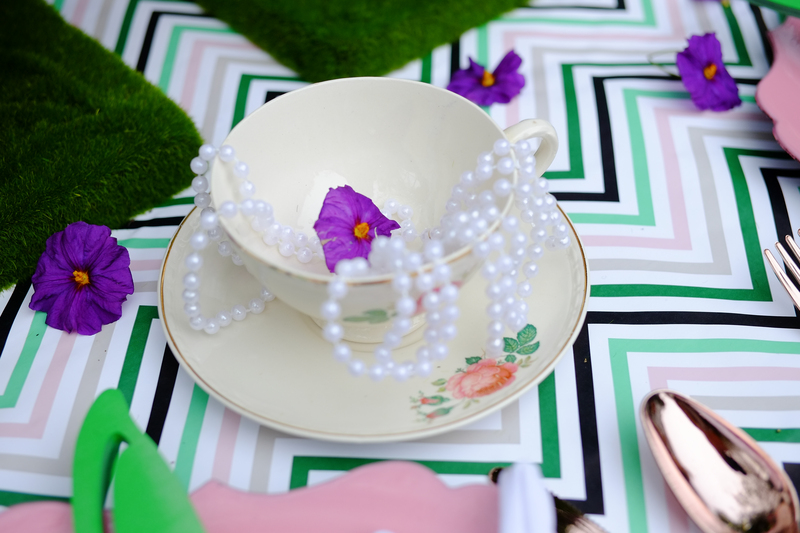 The main “look” for the table was the chevron wrapping paper. I used this as a super wide table runner, this is a really economical option and also means less washing up! And the kids can draw on it for some extra entertainment. 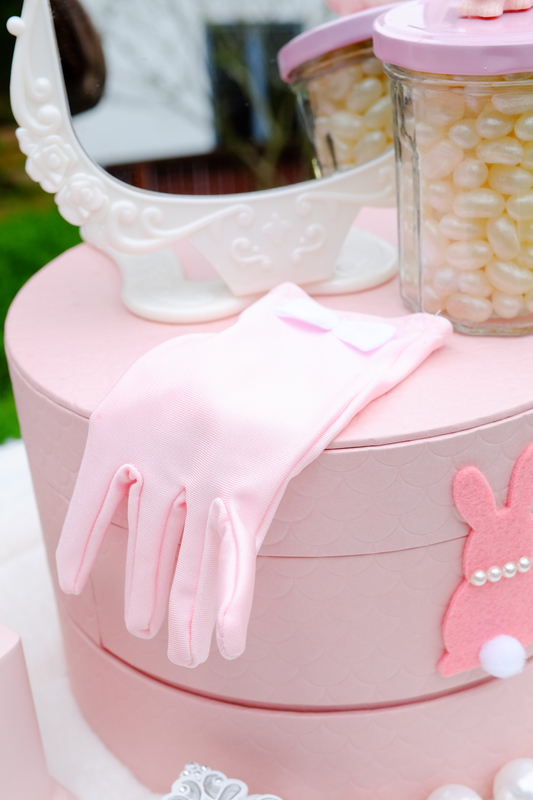 I then did little lady place settings with dress up accessories like the gloves and masks. 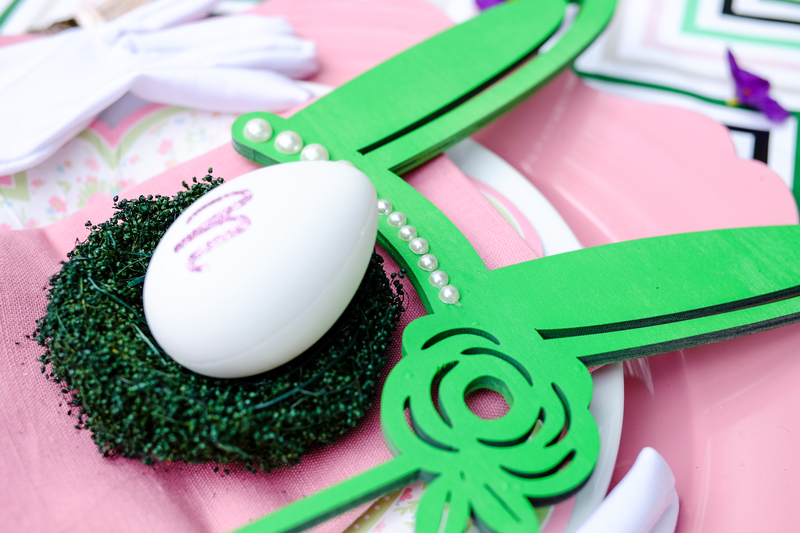 Their chargers & napkins in pink and the egg nest in green to fit with the runner. 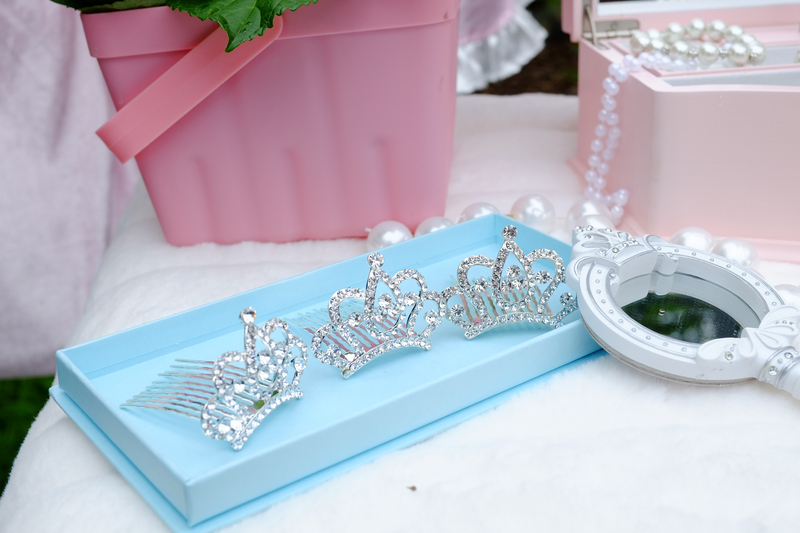 Finally, grown up tea cups and saucers for each girl, filled with pearls for them to wear, completed their place settings. The trivets made great stands for the tea pots, I love these teapots, they have the cutest little birds on the top! 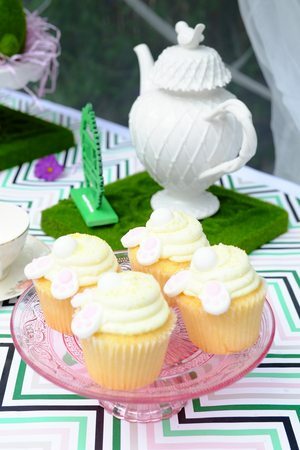 The cake and the bunnies were put onto matching cake stands and the trivets. 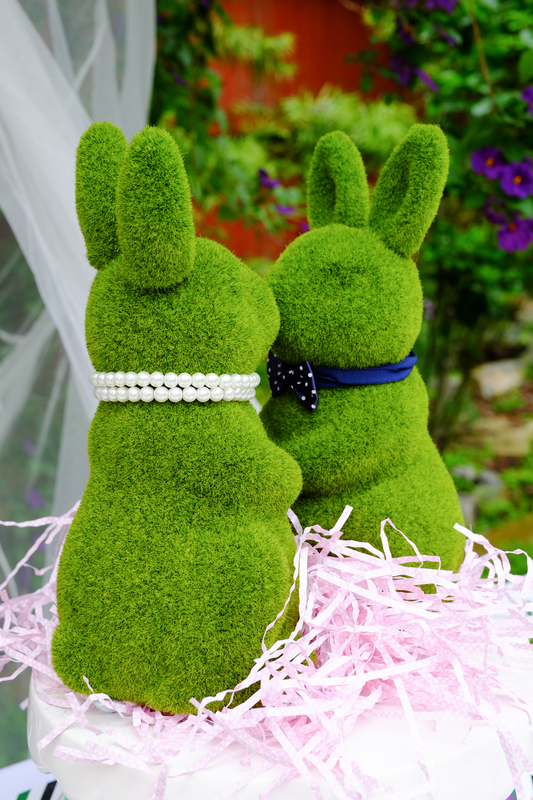 I hung the frame in the tree behind the bunnies to frame their kiss, hugely amusing for the girls! 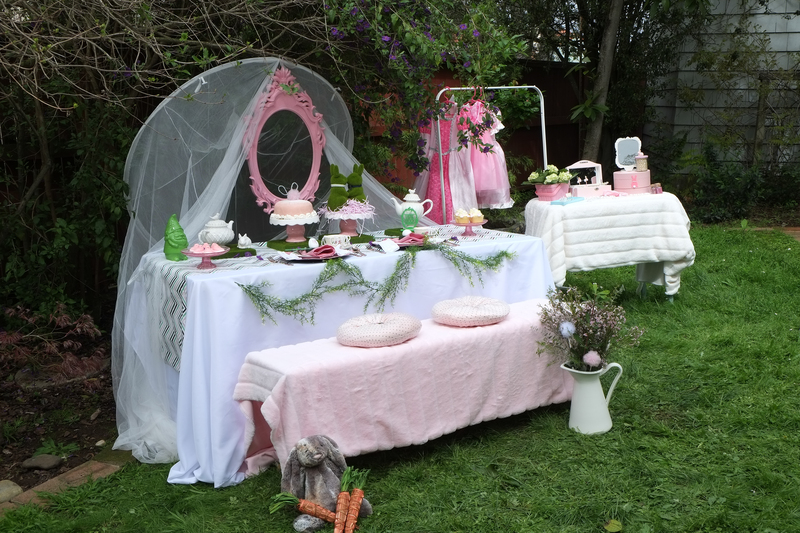 And used my daughter’s bed netting to frame the table. I’m always pillaging their rooms for props! Lastly fur! We kinda had a lot of this courtesy of Phuong! Over the bench with some sweet pink cushions on top, another Ikea find. The main part of the afternoon was dress up, so we stuck to a selection of sweet treats for bribery (if they got sick of their photo being take!) 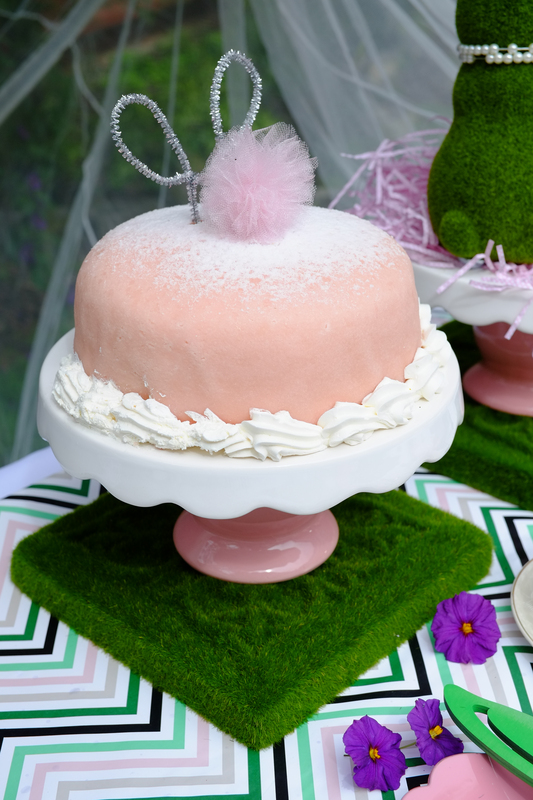 Peeps, cupcakes and a classic pink princess cake from our local supermarket. I made a burrowing bunny on top of the cake with silver pipe cleaners for ears and one of the poms (made by Fizzy Party) as a tail. 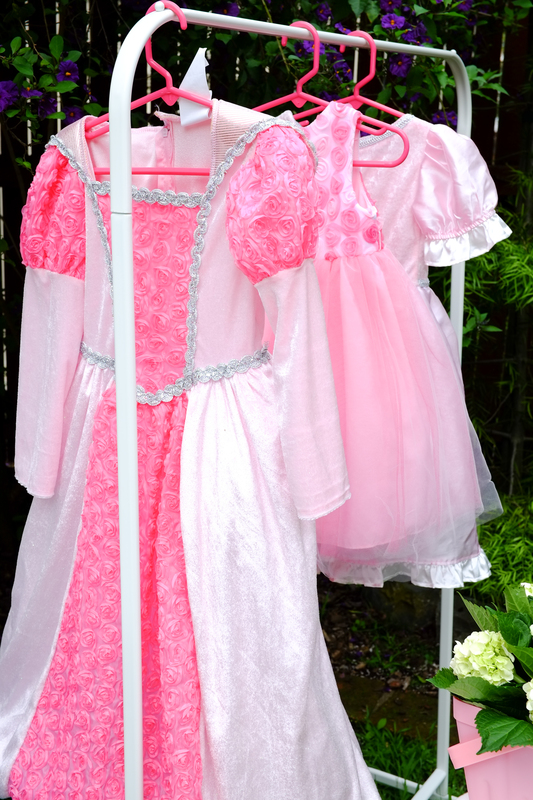 I set up a dress up station next to the table for them with pretty pink princess dresses, tiara clips, pearls, gloves, masks, and of course lots of faux furs. 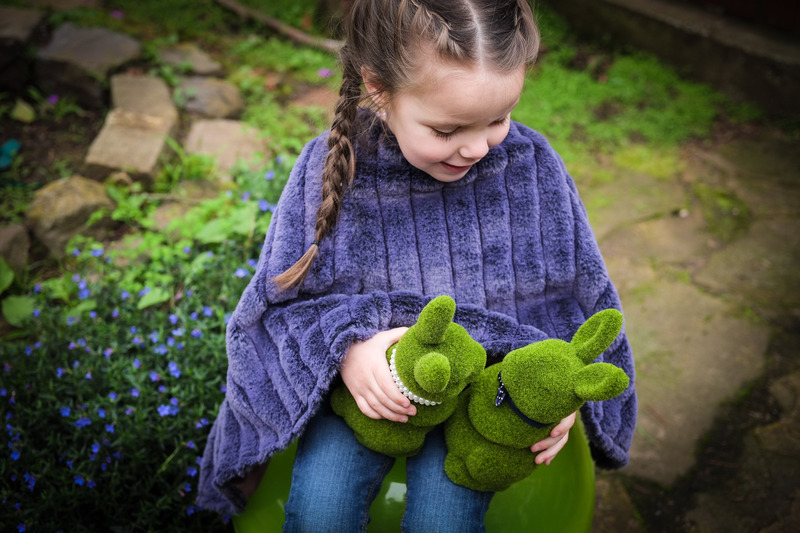 This is something you can easily do at home, I took a small table and threw a fur over it. 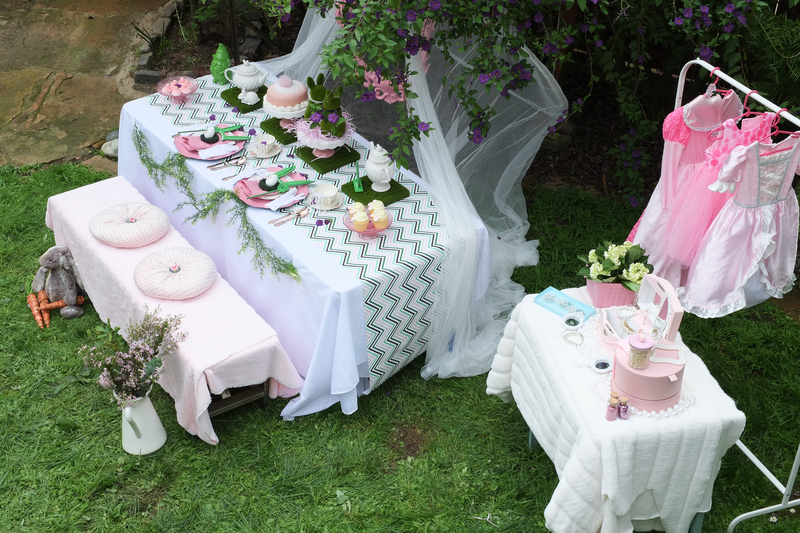 You could use a small blanket, a table cloth, a cut of fabric or even some lace. 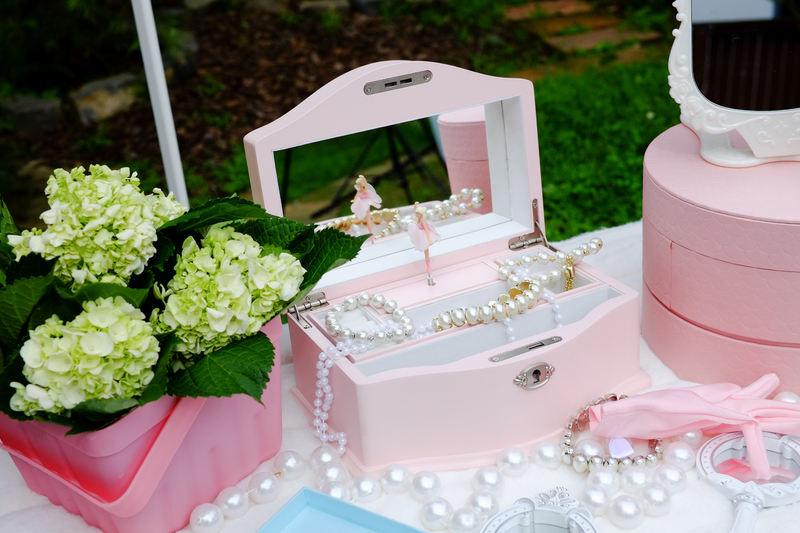 I used my own and Parker’s jewelry boxes, added faux pearls and clips you can find at target and some mirrors (hand held & one for larger viewings!). 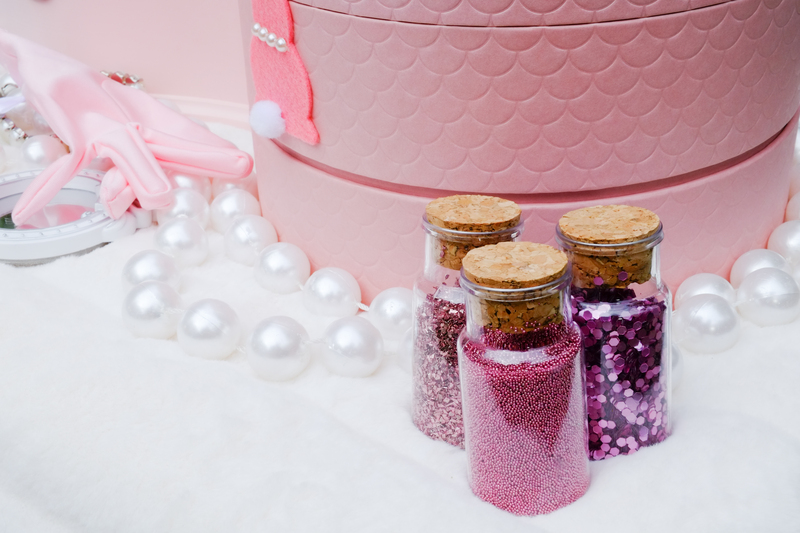 Anything pretty and sparkly will work! With the ability to admire their outfits! 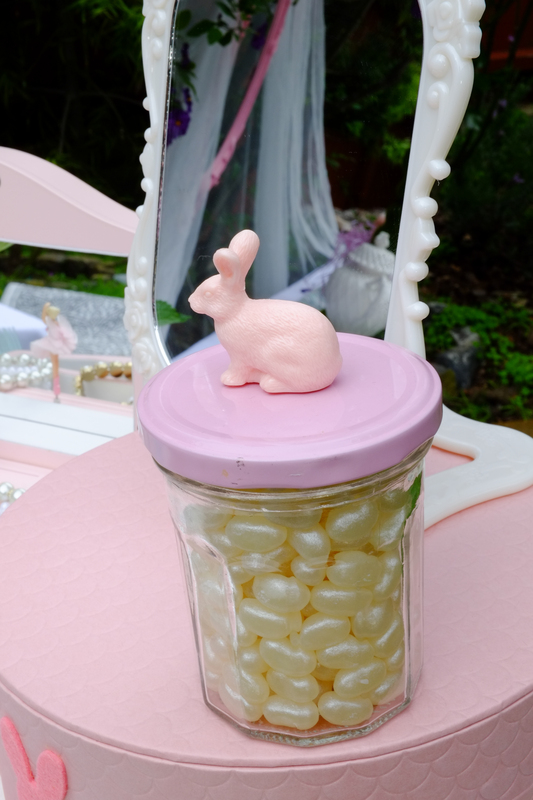 I love fresh flowers for a tea party so I grabbed my go to for an outdoor setting, a gorgeous set of wild looking flowers and used a water jug as a vase, I also added simple hydrangeas to a pink Easter basket for the dress up station. I then added some fake stems directly to the front of the table – tip: a fresh white tablecloth is gorgeous but looks like a big block of white in pictures if you don’t break it up with something. I had a low bench so needed something, these florals were perfect. 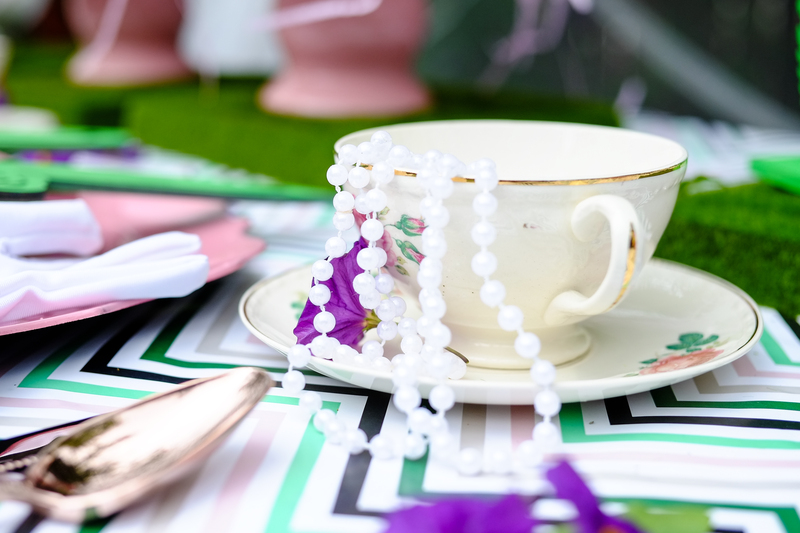 There was a little bit of rain as I was setting up, it didn’t last but it did impact the wrapping paper, a couple of small wet marks – a few purple flowers from the tree above scattered on the table and it was all sorted. 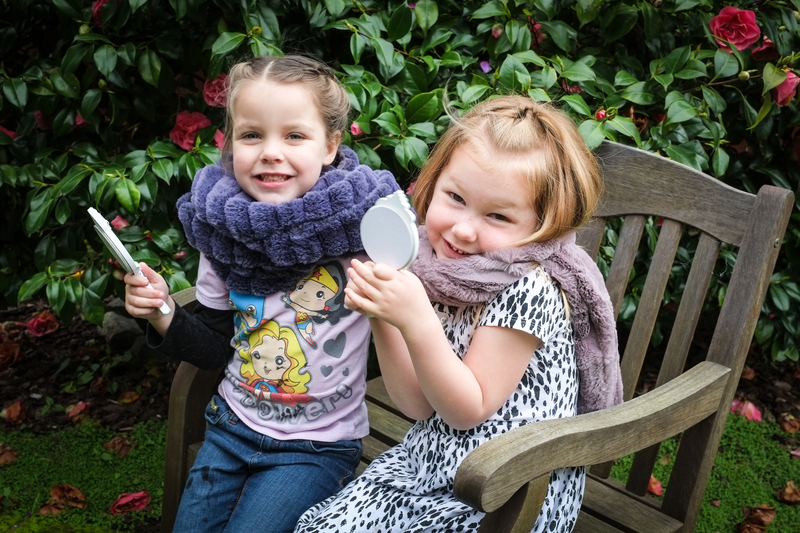 The girls sat down like little ladies and gobbled sweets! No more ladies, sugar rush!! 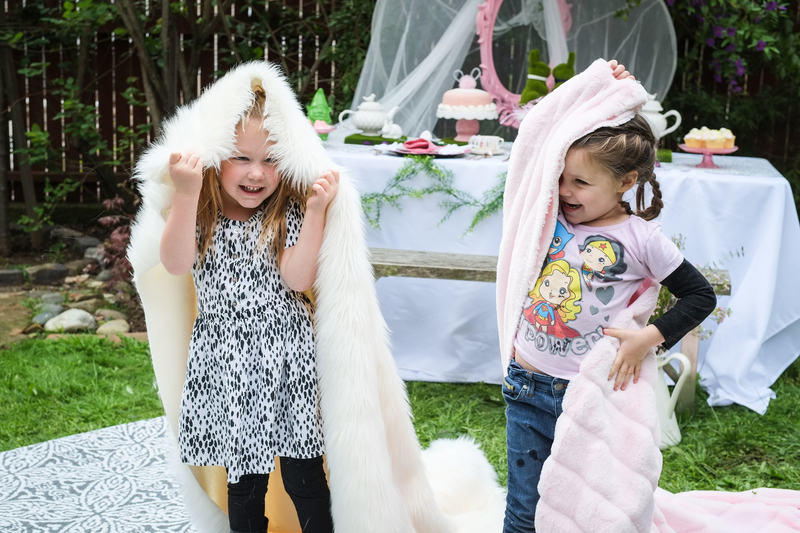 !….they had a blast dressing up and using the props I had left out, mirrors, pearls, masks and gloves you name it they tried it. 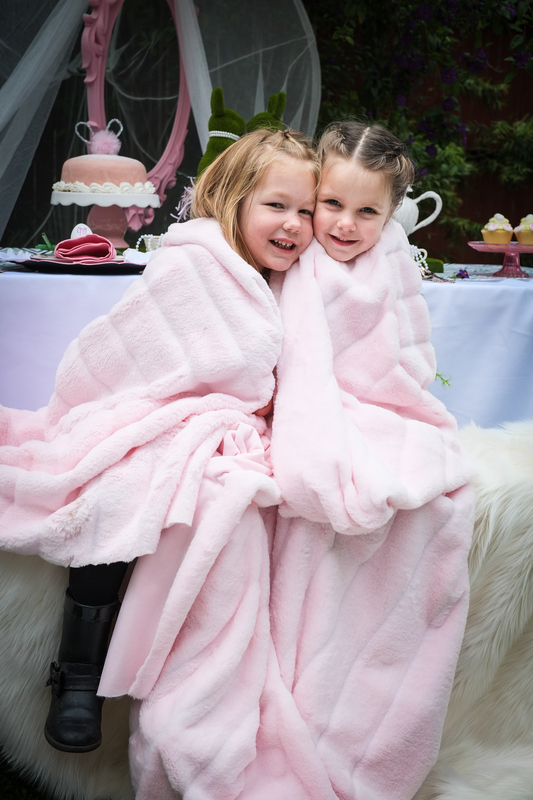 Phuong got some great shots of the girls in faux furs for her catalogue, so she was very happy, even if the girl’s favorite part was rolling around in a heap of them! Great little models! The frame over the table had been black for Halloween! I use it over and over for parties. 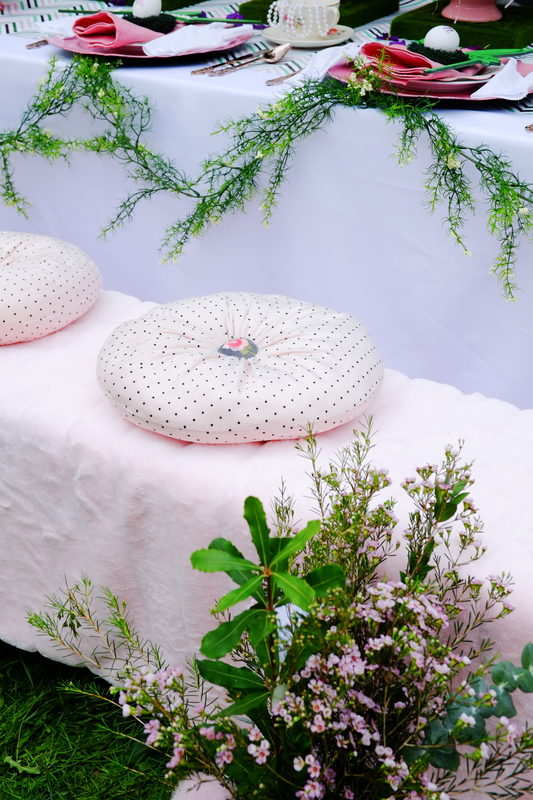 It can be transformed using a white spray paint to prime it then followed by the color I have chosen (pink) or just go for a spray with an inbuilt primer. I found this frame a long time ago, it had an old cracked mirror in it which I took out leaving just the frame. 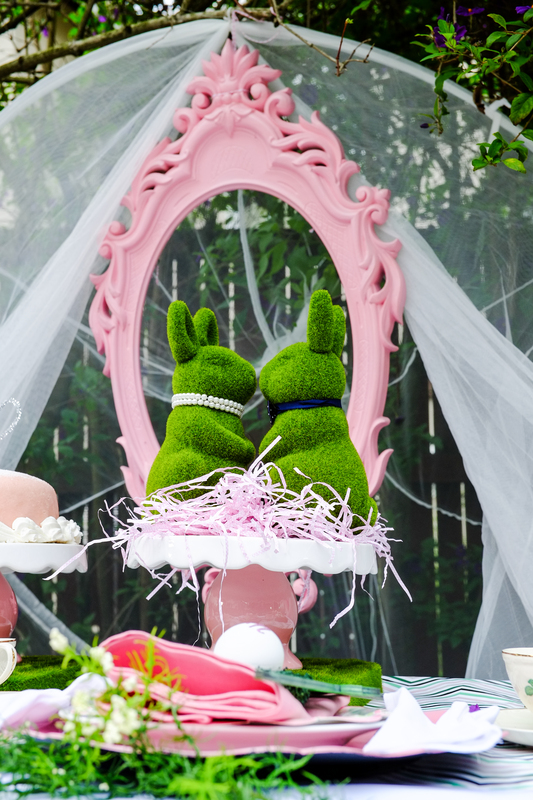 It’s been great for photo booths as it is so ornate and now it worked beautifully as a frame around our loved up bunnies!